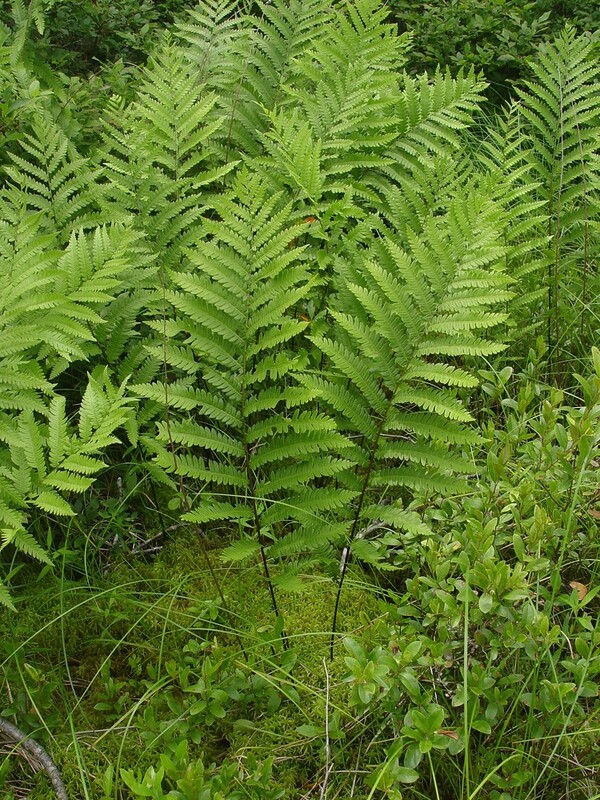 Woodwardia virginica is a fern from a creeping rhizome, 0.6-1 cm thick. Leaves closely spaced; to 1.4 m long, leaf stalk longer than blade, purple-brown, shiny, swollen near base; blade to 50 cm long, 25 cm wide, pinnate-pinnately lobed, tip long-tapered, base tapered somewhat, leaflets 15-20 per side, narrow, tapered at both ends, pointing upward, stalkless, deeply lobed with 15-20 segments per side, lobes oblong, tips blunt, veins with chain-like pattern near midrib, outer veins irregularly pinnate, dense. 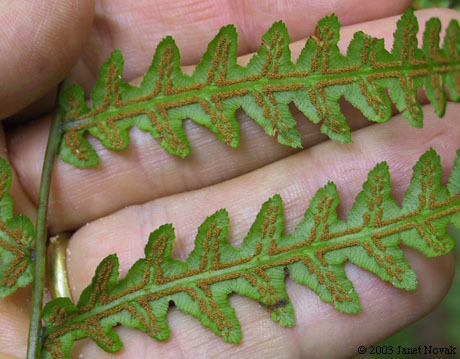 Woodwardia virginica. By Donald Cameron. Copyright © 2017 Donald Cameron.New England Wild Flower Society.gobotany.newenglandwild.org (Accessed 4/2017). Spore cases in continuous chain-like rows, end-to-end along midribs of lobes and leaflets (Cobb 1968). Habitat: Bogs, swamp forests, wet, acid soil.